And as we are bearing down on Valentines Day I am in dire need of a dessert, or more likely TWO and will likely eat both of these myself, it being a dessert for two thing. But who’s counting? No one. The world is depressed. In the world of make-ahead desserts, the banana split that doesn’t melt is somewhat of a miracle. And a pudding that is made up with more than a few delightful toppings is pretty much a banana split, because darned if it doesn’t taste just like it. Except unlike those banana boats from the DQ in the middle of a steamy July which are half melted tubs of sticky milk before you can get your first taste….these don’t melt. And as far as building them ahead so as not to interfere with your dinner for two, just build it up to the point of adding the last whipped cream and the cherry, and they are easily covered with plastic in the fridge for hours on end, with the finishing touches added as you get ready to inhale them. 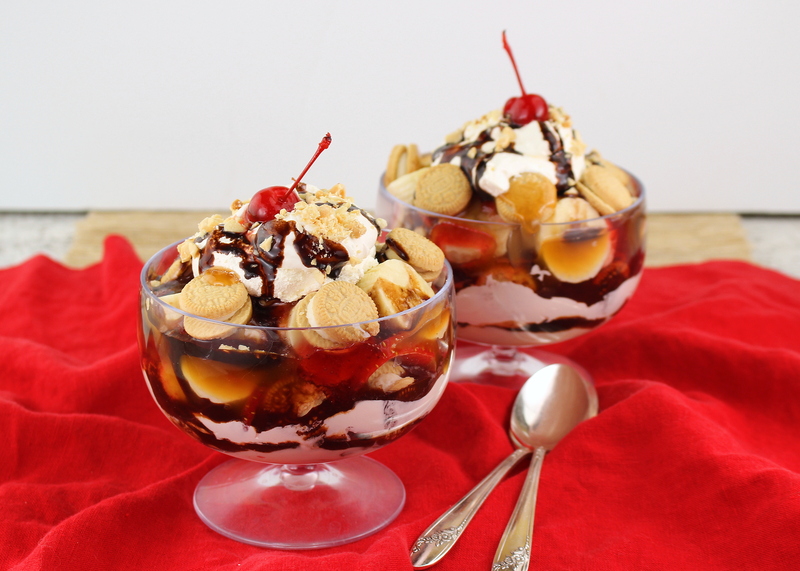 And while that all leads to romantic dining experiences, one of the best things about a no-cook dessert of this type is that it is something that the kids can made for Mom and Dad before they get shuttled off to the babysitter for date-night. And you know, they can even make a few for themselves too. Don’t forget to scroll on down to the bottom to see the full line-up of the #RecipesForTwo event. There is certainly something for everyone, except that one odd person who likes them all. Good grief, I am already hungry for another of these! Put half of the pudding into the bottom of the dessert cup, and layer the ingredients from there, ending with whipped cream, nuts and cherry. Layer the toppings twice so they are not all in one spot. A tip for making ahead, leave off the last whipped cream and cherry so it doesn’t get smooshed, and cover with plastic and refrigerate until needed, adding the finishing touches just before serving. These are the most delicious-looking “banana splits” that I’ve seen in a long time. Thanks for joining us this week! Sue, you should really share these with your husband….he’s depressed too LOL. 3 more years. So easy and fast! I love that you used pudding cups! These are such fun little trifles and I love all the layers of flavor and texture! And I’m with you – as much as I love to bake, sometimes I just…can’t! Great idea! This is truly making lemonade from lemons- you made those pudding cups into something delcious looking!